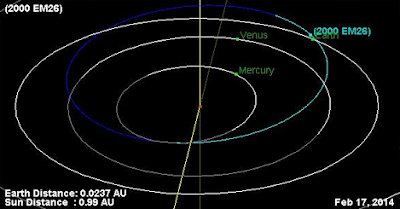 For those of you who may have been alarmed to see the fiery image of the “potentially hazardous” asteroid, known as 2000 EM26, on The Guardian website, you will be pleased to hear that this 270 metre-wide rock passed safely by beyond the orbit of the moon today – just as predicted by astronomers. Although 2000 EM26 is a much larger asteroid than two of our more recent asteroid encounters, it does not pose any hazard to the Earth. Almost exactly a year ago, we tracked asteroid 2012DA14 from our observatory as it made a very close pass to the Earth in February 2013. And, during that same week, a much smaller object unexpectedly entered the atmosphere over Russia causing a window-breaking sonic boom before breaking up. At the University of Hertfordshire’s Bayfordbury Observatory, we keep an eye on these large rocks as part of an on-going programme to monitor ‘Near Earth Objects’ (NEO).